Upon certain moments, seasons change. Kyle Bartley’s last minute header at home to Brentford, Ronaldo Vieira’s long distance winner away at Norwich, maybe Chris Wood’s late overhead kick back in August against Fulham. They all instilled belief in individuals and the team as a whole, and played a big part in this season turning out like it has. At the other end of the scale we could point to Reading’s winner last Saturday, a poor performance in the 2-0 defeat to Brentford this week or the decision to drop Pontus Jansson against Brighton and the potential fallout from that, as reasons why Leeds won’t get automatic promotion and may fail in the lottery of the play-offs. But we don’t really want to think about that right now, do we? Plus, it’s all conjecture anyway while we don’t know the conclusion to the captivating joyride of season 2016/17. At the Old Peacock seasons are changing for us too. The sun has a bit more warmth in it, the trees have some colour and our beer garden is looking more alluring and a bit more invigorated with life. While the sheer number of Leeds fans that converge on the pub on matchdays means an overspill outside is inevitable, whatever the weather, it is always nice to see the sun shining and the odd customer venturing outside during the week and on non-matchday weekends. We are blessed with plenty of space on our much-treasured patch of LS11 and it is great when we can use it a bit more. For Leeds United the term ‘seasons change’ refers also to the bigger picture. Not many Leeds fans would admit to having predicted this season would play out the way it has. Garry Monk was always a great appointment in the context of the other managers the club were seen to be approaching last summer, but with meagre resources at his disposal and a number of low-key punts in the transfer market, nobody was expecting too much other than another hard slog towards maintaining our birth right of 15th place in the Championship table. What has happened since has reawakened the club in terms of attendances, expectancy and excitement, and has elicited this strange new phenomena; being interested in the league table after February, and not only that, taking a vested interest in the play-offs rather than looking on green with envy at them, like a party we are never invited to. Suffice to say, this time next month we will be about to play our last regular season game at Wigan Athletic and we should have a pretty good idea who we are likely to be playing in the high drama of the Play-Off Semi-Finals, assuming of course that we can hold onto the top six spot that has been ours since October. Standing between Leeds United and a certain play-off spot are six remaining games which will shape the club’s destiny and play a significant role in whether this truly is a season of change. Three of these are away games at Newcastle United on Good Friday, at Burton Albion on 22nd April and the final game of the 46-match Championship campaign at Wigan on 7th May. The other games are the three remaining home games that all reside in April and all now carry major significance. First up we have Preston North End this Saturday 8th April, followed by Wolverhampton Wanderers on Easter Monday and finally Norwich City on 29th April. The smart money says that if Leeds win those three home games then they should be safe in the play-offs, but depending on other results, the odd win on the road certainly won’t do us any harm. What we can be assured of is three more mammoth occasions at Elland Road, most likely drawing in crowds in excess of 30,000 once again, and all being well, these will culminate in a Play-Off Semi-Final at Elland Road. So let’s hope that we will be seeing each other again – over the bar, in the beer garden or in the marquee outside - in May. Another huge change for our parent company Ossett Brewery is going on down at Granary Wharf in Leeds at the moment. Over the last couple of years this area has changed considerably, and the extra pedestrian traffic created by the £20m invested in the Leeds rail station southern entrance, which opened in 2016, has been a major factor in the success of the three bars operated by Ossett Brewery in that area; The Hop, Archie’s and the Candlebar. 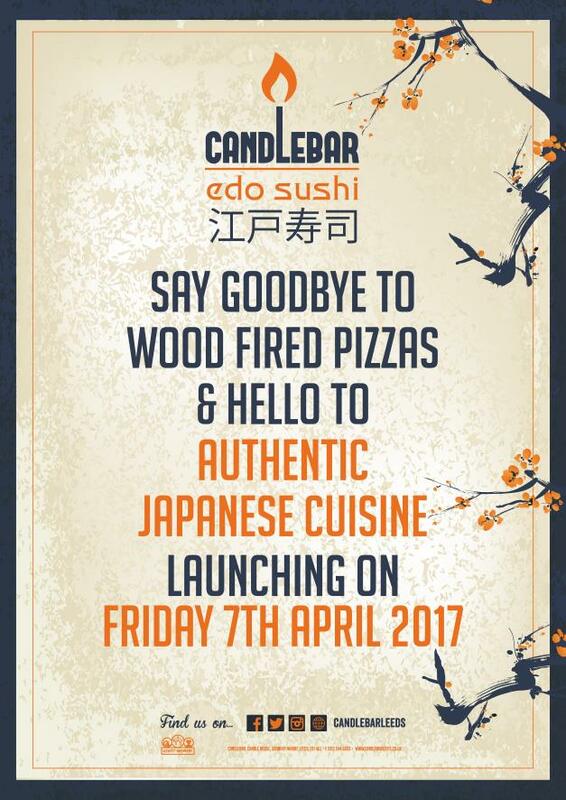 Another part of that success has been the standard of food offered, with the Candlebar in particular taking the plaudits for the quality of the stone baked pizzas coming out of its wood fired oven. Over the years, however, Ossett Brewery haven’t been known for resting on their laurels, and the success of the Old Peacock shows how wise they were to invest heavily in this iconic pub in 2013. Now, a new era of culinary experiences is coming to Granary Wharf, as the wood fired oven is being transferred to Archie’s so pizza fans won’t be denied their regular fix, while a food revolution is taking place at the Candlebar. 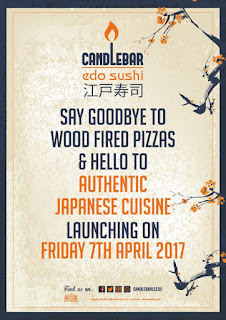 April sees the launch of ‘edo sushi’ at the Candlebar; a unique partnership of quality craft and cask ales with fresh and authentic Japanese cuisine. Ossett Brewery are introducing Japanese chef Tomonori Hasegawa to the Leeds public in a bold move to push the culinary barometer up a couple of notches, and we are confident the tranquil and high quality surroundings of Granary Wharf will embrace the fresh, light and aromatic delights that will be emanating from the Candlebar’s kitchens. So if you are venturing into Leeds city centre on a non-matchday, you will be sure of a friendly welcome and a new and exciting food experience at any of our Granary Wharf sister bars. So there is plenty of change going on around the Old Peacock and the city of Leeds at the moment, and let’s hope that the biggest change is the one that we have waited longest for; Leeds United back in the top division. See you in May.